Workers of a waste pickers’ cooperative were violently evicted in Sao Paulo. Legal steps were taken by MNCR to allow workers recover their equipment and return to their workplace. Workers from the Cooperativa Recoopera in Valinhos, Sao Paulo, are fighting back using several legal bodies to legally claim the building. The fight started on May 25th, when the prefecture took over the building and evicted the members of the cooperative from their workplace. Officers entered the building without a warrant, breaking doors and locks, and destroying documents and goods belonging to the workers. 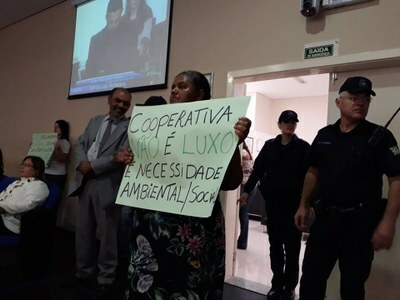 The municipality of Valinhos ignored their need to work, leaving them unable to recycle after working materials and equipment were taking from them following the eviction. The community of Valinhos has joined the call of waste pickers and it is conducting a fundraising campaign for the benefit of the cooperative.